@Dan R, you may not be getting much of a "twist" action on your kick serve because your spin rate is not high enough. Or your spin/speed ratio might be too low (your forward ball speed might be too high relative to the amount of spin imparted). You will probably find that, when you get the "twist" action/bounce on your kick serve, you are getting more of a telltale quick brush sound at impact. If you can get the ball spinning faster (relative to fwd speed), the ball should acquire enough spiral spin (Z-axis spin) as the ball travels thru the air to yield a twist bounce. They are all kick serves, twist serve is a made up thing. The American twist and the concept of a twist serve predates the term, kick serve, by quite a bit -- perhaps by a century. First heard the term, kick serve, used in 1990s and widely in the '00s. The American Twist usage has been around, I believe, since the 19th century. For current usage, the twist serve appears to be one of 2 or more classifications of the broader class serves known as the kick serves. All kick serves probably have some component of a Z-axis spin (resulting in a sideways deviation at the bounce). For many kick serves, this side action is relatively minor -- the ball primarily kicks upward and forward (wrt the server) -- not very much side bounce deviation. However, for the twist serve version of the kick serve, the Z-axis component and side bounce is very pronounced. Many ppl who hit kick serves do not hit a pronounced twist version of it. Short answer: Magnus effect of sidespin before bounce, and preservation of sidespin axis direction after bounce. Not exactly. Magnus effect on topspin and (vertical axis) sidespin components. But no Magnus effect on (Z-axis) spiral spin component. But it is not the preservation of sidespin direction after the bounce -- sidespin, itself, has NO effect on bounce direction -- the ball (normally) tends to travel in the same direction post-bounce as it was pre-bounce. It is the presence of a Z-axis component (spiral spin) that accounts for the (left/right) directional change. the ball (normally) tends to travel in the same direction post-bounce as it was pre-bounce. My point is that this is not the case when a ball with spin hits a racket or wall, but usually is the case when it hits the floor, and that's because of the angle of impact only. If you can get the serve to drop more straight down, and assuming is has some side spin, it will twist. As you pointed out getting it to drop straight down requires a lot of spin, and not too much pace. There is negligible spiralspin component in any tennis shot at the moment of impact. This is a made-up thing. The AT, however is real. Due to the laws of physics, a tennis racquet can only contact one side of the ball at one time, with a velocity vector pointing in a single direction. Yes & no. Spiralspin component on overhand tennis serves at impact are typically, if not always, are slight or small compared to other spin components. However, I don't believe that we can dismiss them as negligible. But it would appear that, given sufficient spin rates, the spiral spin component at the bounce, will often be significantly greater than it was at impact. An acquired spiral spin component, if you will. In your post above, you specified "in any tennis shot". Not sure that this it true either -- in particular, for some underarm shots. I've seen plenty of sideways-bouncing drop shots from Federer and others where there appears to be very significant components of sidespin and spiral spin, at impact, in addition to underspin. Not quite following this. What do you mean by "angle of impact only"? Are you discounting the effect of spiral spin on bounce direction? For a topspin-slice serve, with negligible spiral spin present, the post-bounce direction will be the same as the trajectory/direction immediately prior to the bounce. However with spiral spin present, the ball "rolls" in a different direction while on the ground -- the effect is a change in direction on/after the bounce. the ratio of pace to spin will effect how much it reacts with ground (ie. how "kicky" or "twisty" or "skiddy" or "squirty" it is), but if you're just learning, just focus on heavy spin, less pace until you get the feel. side note; coefficient of friction of the surface will also make a big difference too. If you hit a ball with side spin into a wall it will bounce of the wall in the direction opposite to how it came into the wall. If that same ball were allowed to hit the ground it would bounce off in same direction it was going before it hit the ground. That's what I'm referring to as angle. So, to get twist kick all you have to do is get the ball to drop more straight down than usual, and the ground will act more like the wall. For all serves, the ball is rotating away from you on its upper right side. The arrows are the spin axes. 1 - Picture that ball just before touching the court. 2 - Imagine the speed of the ball's felt at every point of the ball's surface as it spins for the kick serve. 3 - Now imagine the ball's lowering to touch the court. Imagine the felt speed where it first touches the court. Demo - You can drill a small hole in a tennis ball and push a coat hangar wire or pencil through. Demonstrate how the spinning ball first touches the court. Think about the felt speed. Where is it the highest? Where is it the lowest? How about the speed and direction where the ball first touches the court? but i'm sure folks have different definitions. For all serves, the ball is rotating away from you on its right side. Demo - You can drill a small hole a tennis ball and push a coat hangar wire or pencil through a tennis ball. Demonstrate how the ball first touches the court. haha, i can hit all these serves... but i find that picture confusing AF! imo, best way to demonstrate all these spins, is to use a basketball or soccerball, and spin/throw the ball appropriately. and then demonstrate, how one is trying to hit the ball (on the basketball), to affect the spin. Not certain if the wall analogy works here. Try a few spin experiments. Spin a tennis ball with your hands. If you impart only sidespin while dropping the ball, it bounces straight back up. Now impart only sidespin but push the ball forward (away from you) in an upward trajectory so that it hits the ground at a steep angle. The ball bounces upward & forward but does not deviate left or right. However, if you impart a spiral spin with your hands, the ball bounces in a different direction than the forward direction -- whether the impact angle is shallow or steep (nearly straight down). According to tennis physicists, like Rod Cross, (vertical axis) sidespin has no effect on bounce direction, But spiralspin does. the issue is that many folks will think they are hitting perfectly true sidepin (axis perpendicular to ground), but really it's at some angle that will cause the ball to skid (imagine serving to deuce court, with side spin axis slightly to right - so essentially the ball is moving left, but the spin is slightly to the right which creates a skidding effect). so is spiralspin the word you're using to define any spin that is not perfectly vertical or horizontal to the ground (or direction of travel)? I get what you are saying, perfect side spin won't affect the direction of the bounce. I think I see what you are calling spiral spin (spin in more than one axis). This part I'm not sure about "However, if you impart a spiral spin with your hands, the ball bounces in a different direction than the forward direction -- whether the impact angle is shallow or steep (nearly straight down)." I agree it will bounce in a different direction from the pure forward direction, however, the impact angle has to have some affect on the direction of the bounce. The more direct the impact the more the surface can change the direction of the spin. Think of a backhand slice for example. It hits the ground with backspin and then leaves with topspin, and if the angle is very shallow then it skids and stays low (has less top spin). If the angle is steep it pops straight up with more top spin. I believe the slice serve does something similar, but since the serve is moving sideways the effect is sideways rather than vertical. Perhaps it was physicist, Rod Cross, who made up both of these terms (gyrospin and spiralspin). The terms, corkscrew spin or corkspin, have been around for quite a while in ping pong (table tennis). They refer to the same phenomenon. Sure, the ball is moving in only one direction and only has one spin. But that one spin can have X,Y & Z components. For my usage, Z-axis is pretty much in the direction that the ball is traveling (might be different than the usage in the Chas example). Most balls that we hit will have a negligible Z-axis component. Therefore their spin axis is perpendicular to the direction of the ball's trajectory. However, when appreciable spiral spin is present, the resultant spin axis is no longer perpendicular to the travel direction -- it is offset somewhat from the perpendicular. A somewhat skewed spin axis (according to Operation Doubles and other sources). This make sense since the Z-axis is not perpendicular to the travel direction. It is, in fact, coincident (the same direction) as the travel direction of the ball. 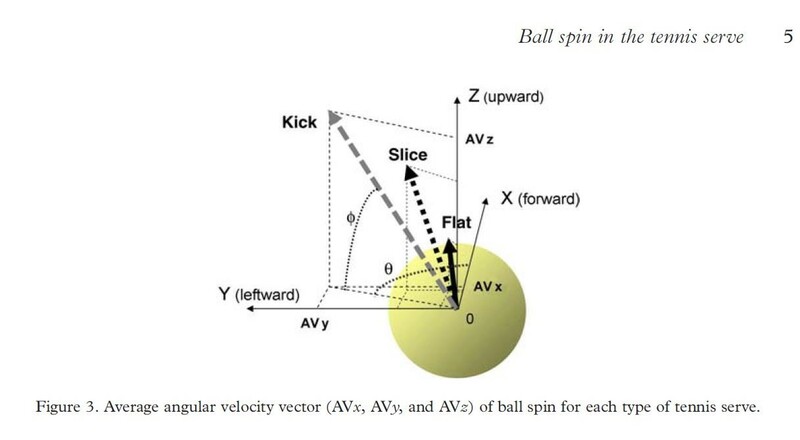 In the picture of the ball spin, the gyrospin components AVx (see the 3 dotted lines in the x direction) are about the same for each type of serve. The kick serve's gyrospin component is only slightly larger. Your example of the sidespin dropshot by Federer is the perfect example a tennis shot that has negligible spiralspin at impact, but then develops a lot of spiralspin in the air before it bounces. The spiralspin develops during flight because the velocity vector changes direction as the ball arcs through the air under the acceleration of gravity, but the spin axis stays virtually constant. A football is thrown with spiral spin because the fingers, palm and thumb are on different sides of the ball. As the ball is released, the fingertips pull down on one side of the ball while the palm supports the bottom of the ball and thumb pushes from behind. A tennis racquet, in contrast to a hand throwing a football, cannot produce spiral spin because it is only acting on one side of the ball, and the racquethead moving linearly with respect to the ball. In the case of table tennis, an advanced player can produce a significant spiralspin component because the paddle is so short that the player can rotate the handle around faster than the head of the paddle, in a corkscrewing motion that twists against the back of the ball, so that the tangential force acting on the top of the ball can be in the opposite direction of the tangential force acting on the bottom of the ball. This is not possible to do in tennis. yup, i've played quite a bit of table tennis, and probably learned alot of spin behaviors more from table tennis. This. Having played loads of table tennis in my younger days mean spins are easy to understand for me. Tennis players should try their hands at table tennis as part of their training. The hand-eye coordination required and reaction needed is tremendous. From what I've seen w/my experimentation & what Rod Cross says on the matter, sidespin has NO effect on bounce direction. I'm thinking of a way to test this. I tried to go out and hit serves to see if I could hit the AT based on my theory, and I really couldn't, but that could (probably does) say more about my limitations than my theory. I'm wondering if I could use a ball machine and set it up for underspin and then tilt it progressively more sideways. If I'm right I should see the ball change direction off the bounce as I tilt it, provided I can get the ball up in the air enough. I might try this for kicks (pun intended). TTW awaits eagerly for your experimental findings! Consider the first image for a topspin-slice serve traveling toward (or away from) us. It has 1 spin axis (titled at 45 degrees). But it has 2 components -- a vertical component and a horizontal component. Difficult to show a 3D representation on a 2D screen. The 2nd image above is an attempt to show the skewed spin axis for a twist serve. It attempts to show spin axis that is not parallel to the screen (or not perpendicular to the serve direction). Yup, as I said, kick is a generic term that refers to a general class of serves. But further taxonomy is possible. Many like to make a distinction between a twist serve (with a strong side bounce deviation) and a kick serve that does not break left/right very much. Others will even opt for 3 types of kick serves: topspin kick, topspin-slice kick, twist kick. But there are really no exact definitions for these various types. EDIT: Some sources go as far to say that the term, kick serve, is rather ambiguous. Measurement of spin rates from high speed video film is relatively easy. The spin axis remains fixed while the ball travels toward the net, so the time for one revolution can be measured in terms of the number of video frames required for a particular mark or pattern on the ball to re-appear in the same orientation." The spin axis stays the same from impact to the net is stated in Physics of the Kick Serve. Cross is a long time tennis researcher that describes his technique for measuring the direction of the spin axis. Assume that it stays the same until impact. As the trajectory curves the direction of the spin axis remains the same. Post #58 will show that the jump to the right is due to gyrospin - all type serves have similar gyrospin - plus the higher speed of the felt at the location of court contact on the ball. The contact point is located farther out from spin axis for the kick serve than for the slice or flat serves as Post #58 will show. Felt speed = Rotation Rate x r , where r is the radius out from the spin axis. The fact that the bounce may grip or distort the ball more because of the sharper angle of the trajectory onto the court may also be a factor. If any readers have questions about post #58, please let me know. It took me so long to understand it and it is simple. I agree that spiralspin can develop, prior to the bounce, as a spinning tennis ball travels thru the air. But I not agree that Federer's drop shot necessarily has negligible spiral spin at impact. It's somewhat more than negligible -- but, likely, not as much as it is at the bounce. I can hit a tennis ball with a brushing action on the underside of the ball that is primarily spiralspin. But this ball moves primarily up and not forward toward the net. If I modify the placement of the brushing action -- not unlike drawing a smile on the ball -- I can get this ball to move forward . But it still has quite a bit of spiralspin imparted at impact. I can modify this even further to add more underspin & sidespin. But I'm still imparting spiralspin at impact. The brushing action is somewhat like the underarm serve (video #2) in post #54. I usually visualize the twist serve as a topspin ground stroke with the spin axis tilted perpendicular to the hop direction. So to hit it and get a good jump sideways I need to get my racquet face tilted to match the spin axis and then have the strings brush the ball like they would for a topspin shot. I don't know if that's precisely correct, but it seems to work for me. I have to hit up and out on the left or inside of the ball relative to me as I'm a righty. We had this discussion before but this diagram is clearly wrong. The kick serve can't have more side spin on it than a slice serve. So, something is not matching up here. A football thrown downfield is moving forward toward the goal line but isn't the spin very much toward the sideline? I think a twist or kick server that bounces to R for a R-handed server spins somewhat like a football. Watch Federer or old video of Santoro hit a kick serve and you see that racket swing path goes more toward the side fence. Yes, there is an element of forward (toward the returner) spin but also a big element of "side spin" in that the ball is spinning toward the side fence too. I can hit a tennis ball with a brushing action on the underside of the ball that is primarily spiralspin. No you can’t, at least not initially. Assuming you drop the ball onto your strings with a negligible drop velocity, the spin axis starts out perpendicular to the initial launch velocity vector with negligible spiralspin. However, by the time your sidespin dropshot hits the court, the sidespin you had applied to the underside of the ball will have been converted to primarily spiral spin because the spin axis will be nearly parallel with the ball’s velocity vector. Thus the ball jumps violently to the side when it hits the court. Yes, I can. I've done it many times. I think you misunderstood the sequence I suggested. The ball that I hit that is primarily spiral spin is not a drop shot. It is not a shot that travels forward very much -- it doesn't even reach the net from NML. I did not misunderstand you. You called it a drop shot. It is not. "Assuming you drop the ball onto your strings with a negligible drop velocity, the spin axis starts out perpendicular to the initial launch velocity vector with negligible spiralspin. ? Isn't it mostly spiral spin? The spin axis of pure 'sidespin' is vertical to the court. The spin axis of pure spiralspin is forward & horizontal. The spin axis of pure topspin is leftward & horizontal. See ball diagram. The spin axis does not change during flight. The direction of the trajectory changes during flight. The spin axes are related to the vertical, a horizontal axis to the side and a horizontal axis forward. See ball diagram. There is no spin axis change during flight related to the court but there is related to the trajectory. Doesn't it start with spiralspin and end with spiralspin.? Do you disagree with any of the above points? I can see that things can get mixed up, court or trajectory reference? But using the court instead of the changing trajectory is much simpler because the ball spin axis stays the same but the trajectory keeps changing. I wonder as the ball is compressed and rebounds on itself if it can't change its axis of spin relative to the court and trajectory. Any video proof of a 120+mph serve showing spin throughout the flight to the first bounce? I'm sure the spin axis says changes on impacts. I don't know of proof. ..................................... The spin axis remains fixed while the ball travels toward the net.........................................................................."
I believe that I have heard similar quotes. I give the tennis researchers the highest credibility. Is that fixed wrt the Earth (or court lines)? Or is it fixed wrt to the trajectory (flight path) of the ball? I have very high regard for Rod Cross but he might not be infallible. Or he might make some simplification or generalization that might be true for the most part. I am thinking about rifle bullet ballistics. For the most part, the rifle bullet travels in a fairly straight line with only spiralspin (aka bullet spin). But after some time time the bullet deviates from this. It can even experience a tumble -- an obvious spin axis deviation. Forces acting on the bullet are gravity, air drag and wind. There might also be a torque associated with the bullet's spin than might eventually alter its path of spin axis. As the bullet deviates from pure spiral spin, Magnus force can come into play. I'm wondering if there might be a small change in a ball's spin axis orientation that Cross considered so slight that he states the the spin axis remains fixed. Note that the spiralspin component, even for a twist serve, is considerably less than the topspin and sidespin components. So, for the most part, the resultant spin axis is "pretty much" perpendicular to the ball flight direction after it leaves the racket and just before it bounce -- even tho there might be a small amount of change. Just some food for thought. No. It is roughly 0% spiral spin immediately after impact. This would be true in a vacuum, but the frictional drag force can change the spin axis in the court frame of reference. No. Every tennis shot begins with zero spiral spin. Depending on the initial spin axis, the spiral spin component of the spin can increase during the time the ball is in the air while the direction of the ball's velocity vector changes due to gravitational acceleration and drag. This seems to be the source of the confusion. In the court frame of reference, 3 dimensions are required to describe the direction of the spin axis. However, in the racquet or ball frame of reference, an oblique impact between a tennis racquet and the ball can be accurately modeled in 2 dimensions. Thus it is much simpler to model the impact in the racquet frame of reference. In the racquet / ball impact frame of reference, the force vector acting between the two objects at the moment of impact has two components -- a normal force and a tangential force. Neither of these force vectors contribute any spiral spin (both component vectors act in the same 2D plane passing through the center of the ball). For there to be spiral spin, there would have to be another force vector actor on a different side of the ball with a component perpendular to the normal and tangential force components of the impact. In the case of a pure 100% (9 to 3) slice serve hit with 100% horizontal initial velocity and with vertical spin axis (to pick a simple case), the spiral spin component of the spin will gradually increase (from a starting value of zero) during the ball's flight and reach a maximum at the moment of impact with the ground. The more vertical the path just before the bounce on the ground, the closer to 100% spiral spin. The way to hit a ball that gets closest to 100% spiral spin at the bounce is to hit with 100% side spin, but hitting the side of the ball half-way underneath the ball and halfway behind the ball. The initial velocity will be roughly 45 degrees upward, but gravity will bend the path so the ball will descend at roughly 45 degrees downward (neglecting drag). Due to the 90-degree change in the velocity vector, the spin axis will have been converted from 0 to 100% spiral spin. A twist serve also starts out with zero spiral spin, but the ball develops a significant amount of spiral spin during the air by the time it bounces on the court surface. a normal force and a tangential force. Neither of these force vectors contribute any spiral spin (both component vectors act in the same 2D plane passing through the center of the ball). For there to be spiral spin, there would have to be another force vector actor on a different side of the ball with a component perpendular to the normal and tangential force components of the impact. Do not fall ill to zoomitis! The same rules of motion apply whether the ball and racquet are rigid bodies or not. The rigidity of the bodies just changes the relative contributions from the normal and tangential forces. The spin vectors of all three types of serves are shown as tilted to the left and forward. The forward component part is spiral spin. These are measured spin spin vectors. The racket roughy moved perpendicular to the spin vectors but ball distortions, string distortions and racket rotations probably make a difference. The result is this ball diagram. AVx is the component of the spin vector that is called spiral spin. All three AVx's show observation of a spin vector component in the spiral spin direction just after impact. markers, 58.1 g) deﬁned the local coordinate system on the ball (Figure 1b)"
Do you have any other references that supports your views? Especially the clear point of Cross that the spin axis remains the same to the net with nothing said after that. I showed how the spin shown in the above picture above would produce the observed bounce of the kick serve along with a demo. And why. And provided a demo. We disagree, let's leave it at that. I quoted Cross and this reference by Elliott another tennis researcher. I believe that I read in the publication that they used the court as a reference. I showed how the spin shown in the above picture above would produce the observed bounce of the kick serve along with a demo. I just re-read the article. Indeed Rod Cross has made errors in his discussion of "gyrospin." This is not the first time that Cross has made a statement that can be easily disproved ( his gyrospin explanation can be disproved with a ball machine and a way to tilt it sideways). In the article below, his explanation for why handle weighting helps a player swing more easily can be proved incorrect. Clearly he wrote the article based on ideas in his head and without actually experimenting different weighting combinations and swinging a racquet himself. Doesn't matter, since both "sides" are perpendicular to 2D plane that contains center of the ball as well as the normal and tangential force components. I don't think that the spin axis stays perfectly the same but near the same to the bounce. Put a pencil through a hole in a tennis ball and spin it. Lower it to contact a flat surface. Do the angles shown in the ball spin vector diagram. The bounce to the right should occur. To single frame on Vimeo, click Vimeo, full screen and hold down the SHIFT KEY use the ARROW KEYS. Here is probably a top spin serve or kick serve by a rec player. On my original video the print is clearer I saw 4 rotations indicating 3600 RPM (240 fps). The Vimeo processing made the original less sharp so maybe you can't see the print well enough to estimate the spin axis. Go frame to frame and see what you can see. I can't estimate the spin vector but it looks stable. Of course there are many forces acting in all directions during the impact. But any forces acting outside of the 2D plane are balanced out by equal forces on the opposite side of the plane. We only care about the net resultant vector, which can be reduced to two components.